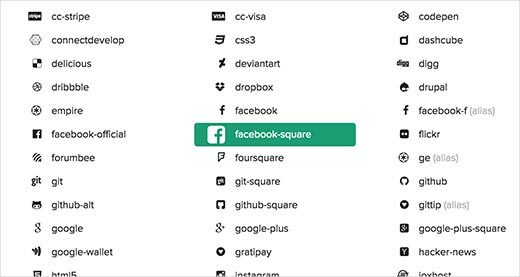 Recently one of our users asked us for help in finding free social media icon sets that they can use on their website. While, there are plenty of WordPress plugins that allow you to add social media icons in WordPress, some users may want to manually add custom icon images and link them to their social media profiles. In this article, we will show you some of the best free social media icon sets for WordPress users. If you’re looking for WordPress plugins that lets you add social media icons, then check out our articles on how to add social media icons in your WordPress sidebar and menus. If you’re looking to add a floating share bar like our site, then use Floating Social Bar. Having said that, let’s take a look at some of the best free social media icon sets that you can use. Genericons is a free and GPL licensed icon font created by Automattic. It is a complete icon set, with icons for the most popular social media sites. For beginners, adding icon fonts can be a bit difficult. A simpler way to use Genericons icon set on your WordPress site is by installing and activating the Genericon’d plugin. Upon activation, simply go to Appearance » Genericon’d and click on the icon you want to add. Your selected icon will appear on top. Click on the copy shortcode link next to your icon and a popup window will appear with the shortcode. Copy and paste the shortcode wherever you want to display the icon. You can also copy the HTML and paste it in a text widget to display the icon font. Font Awesome is another free and open source icon font that you can use with WordPress. Font Awesome comes with an large collection of icon fonts. You can manually add Font Awesome to your WordPress theme or you can use a plugin. Simply install and activate the Better Font Awesome plugin. It comes with shortcodes, HTML, and TinyMCE options to easily add icons anywhere on your WordPress site. We understand that most beginner level users would find adding icon fonts more difficult than adding image files. Flat Social Media Icons is a compact set of the most commonly used social media icons. You can simply download and extract the icon set and then upload them to your website from Media » Add New page in WordPress admin area. This icon set comes with 40 beautiful icons including 25 social media icons. Each icon comes in 512px dimensions and you can customize them in photoshop if you need. This is a simple but beautifully done social media icon set. Created by Michael Dolejs, this icon set is available as a PSD file. You can open the PSD file in Adobe Photoshop and use the icons as you see fit. This beautiful free social media icon set contains two variations rounded and square icons. There are 10 icons of 64x64px in jpg and png formats. This beautiful icon set contains 40 social media icons. Each icon is available in four sizes 32×32 px, 64×64 px, 128×128 px, and 256×256 px. There is a long shadow added to each icon giving a beautiful effect to each icon. This flat social media icons set by Enfuzed comes in two variations. The full color flat social media icons and light transparent social media icons for dark backgrounds. This social media icon pack by Martz90 showcases the popular social media icons in hexagonal shape. The icon pack contains a large number of icons for most popular social media sites, news sites, services and games. 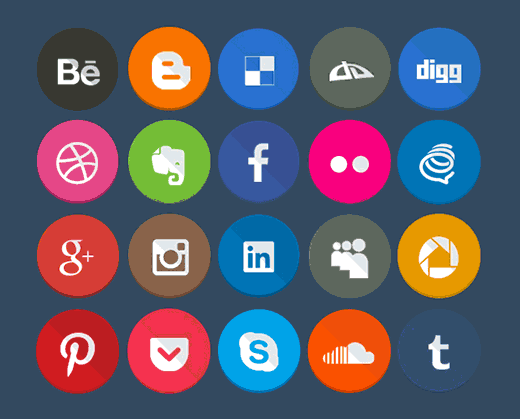 This beautiful circle flat social media icon set by Land of Web is retina ready. All icons are in png format and are available in 256x256px, 128x128px, 64x64px, and 32x32px sizes. This beautiful social media icon set by LunarPixel contains 80 polygon shaped icons. The package also contains the original vector files for you to play with. This unique and beautiful icon set is created by Dawid Dapszus. It contains 20 icons for most popular social media websites. All icons are 80x80px and in png format. This beautiful icon set comes with PSF and PNG files. It contains 20 icons, each icon file is 114x114px in dimensions. This beautiful set of free social icons set by Mohammed Alyousfi comes with 24 icons. It contains icons in sizes ranging from 512px to 16px. The package also includes source files in AI and EPS file formats. This icon set by Luke Taylor comes in two variations for dark and light backgrounds. The package contains 89 social media icons in both variations. A beautiful set of social media icons created by Hugo. The package contains 8 icons in a neat PSD file. You can then use save for web to save the icons you want ot use on your site. We hope this article helped you find the best free social media icon set to use on your WordPress site. You may also want to check out our list of 40 useful tools to manage and grow your WordPress blog. This is so timely and time-saving! I was just looking for icons – so nice to have these all listed. This will make the selection so much easier. We use default WordPress comment system with custom styling and a few plugins. See our tutorial on how to style WordPress comment form. Can they be used with WordPress.com? or just .org? Just .org, see our guide on the difference between WordPress.com and WordPress.org. I will be checking them all out as I really can’t choose which ones I like the best. Just wondering, can i add a link so that if a user clicks on them, they’re taken to, for example, my Facebook page? Yes, this is the purpose of using these icon sets.